Despite years of hype, the 2020 Toyota Supra comes with one major crushing disappointment: It’s only only available with an eight-speed automatic transmission. While we shouldn’t hold our breath for a manual Supra since no concrete plans have been shared, we can dig into the BMW parts catalog to see whether a manual swap would be possible. The easiest path to our manual swap might be to look at the European spec 2019 BMW Z4 2.0i, which will be available with a manual transmission. 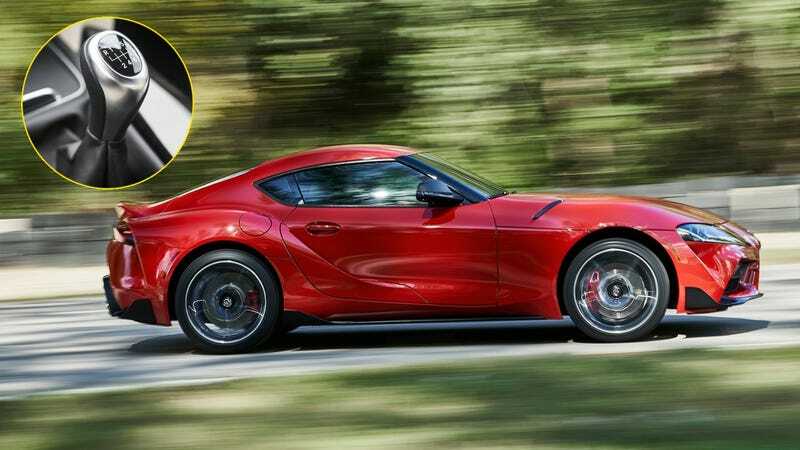 While that transmission is not a good choice for the Supra since it only comes mated to the four-cylinder engine, and in the U.S. market the Supra is six-cylinder only for now, the surrounding components can be useful. One of the bigger pieces in doing a manual swap may have already been taken care of by BMW, as the manual version of the Z4 appears to use the exact same firewall as the Supra. This means that even though the Supra is not available with the manual, all the mounting points for a clutch pedal and clutch master cylinder should already be present. Using the same firewall between cars is not unusual, especially in the case of BMW, as the E46 M3 had provisions for a clutch pedal even in the SMG version. Since we know that the Z4 clutch pedal and master cylinder will mount to the car, they can be ordered from European BMW dealers once the parts become available to solve that part of the equation. The hydraulics that lead from the master cylinder to the slave cylinder can also be used and will likely mount in the Supra the same way that they mount in the Z4 so no custom lines should be required. The pieces are also very similar to the ones used on the last-gen 340i here in the U.S. so those could likely be also made to fit with some modifications. That leads us into the next portion of the swap, which is choosing the right gearbox. Our answer may come from the 340i as it uses a variant of the same B58 3.0L engine and is available with a manual. The bellhousing pattern on the 340i engine and the Supra engine appears to be the same so the six-speed manual GS6-4BZ gearbox should bolt right up. While this is the best available choice at the moment, it is important to note that the Supra produces 33 more lb-ft of torque than the Euro-spec 340i. While it should be within the tolerance range of that gearbox, this is something to bear in mind. Supplementary pieces for the transmission such as the linkages and shifter can be grabbed from the 340i as they will bolt up directly to that gearbox but they may require some customization to be set at the correct length to match up to the shifter hole in the cabin. Alternatively, a Z4 shifter and linkages can be combined with the parts to minimize the fabrication once they are available for purchase. The rest of the hardware, such as the driveshaft, will probably have to be customized since the new gearbox will most likely not be the same length but that part can be taken care of by most driveshaft shops for a few hundred dollars. The only unknown piece of the swap right now is the electronics, since the ECU in the Supra will be looking for an automatic transmission and will go into a limp once it doesn’t find one. But luckily, there is precedent for that modification as well. Since the Supra uses a standard BMW ECU, or DME as they call it, the coding for the transmission should be editable. Once tuners are able to access it, the automatic transmission settings can be removed. Based on these pieces in the parts catalog it appears that a manual swap will be a fairly straightforward proposition on the Supra. I am sure that we’ll see some swapped cars fairly quickly after they start deliveries.